Black Red Kalidar Kurta With Attached Jacket, Gold Borders On Jacket Sleeve And Hemline. Om Embroidered Kurta in Medium and Large Size. - This very graceful hand embroidered ajrakh print cotton kurta piece has elaborate cutwork (applique work) on the front and sleeves. - Back of the kurta is plain. - Size: Width: 43 in; Length: 2.4 mtr. We Deals in Bhama Cotton Embroidery Long Kurta of best quality. 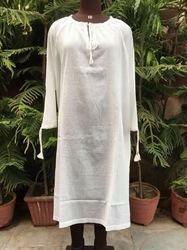 The Cotton Kurta provided by us is comfortable to wear because of the breathable fabric material. This kurta is economically priced and is available to clients in a variety of colors. We are the leading entity in the industry, highly engaged in providing the best quality range of Cotton Ladies Kurta.